A Reverse Auction is a type of auction in which the roles of buyer and seller are reversed. In an ordinary auction (also known as a ”forward auction”), buyers compete to obtain goods or services by offering increasingly higher prices. In a Reverse Auction, the sellers compete to obtain business from the buyer and prices will typically decrease as the sellers underbid each other in order to provide their best pricing for the item/service currently for bid. How does the Reverse Auction process work? How do “Multi-Item Reverse Auctions” Work? What information am I required to submit for my solicitation? What time zone does the Reverse Auction take place? I want to bid on a Reverse Auction. How do I get approved? Are there any bidding increments, or can I submit any amount for my pricing on the Reverse Auction? Do I have the option to use Surrogate Bidding instead of submitting online in a Reverse Auction? Can other bidders see my prices? When can I see the bid results or find out who was awarded the bid? Will the lowest bidder be awarded the bid? I submitted a solicitation online through Central Bidding. How do I know if I am approved to take part in the Reverse Auction process? I submitted a solicitation on paper to the owner/agency of the Reverse Auction. How do I know if I am approved to take part in the Reverse Auction process? How much does it cost to participate in a Reverse Auction on Central Bidding? Is there a percentage fee charged to the bidders? 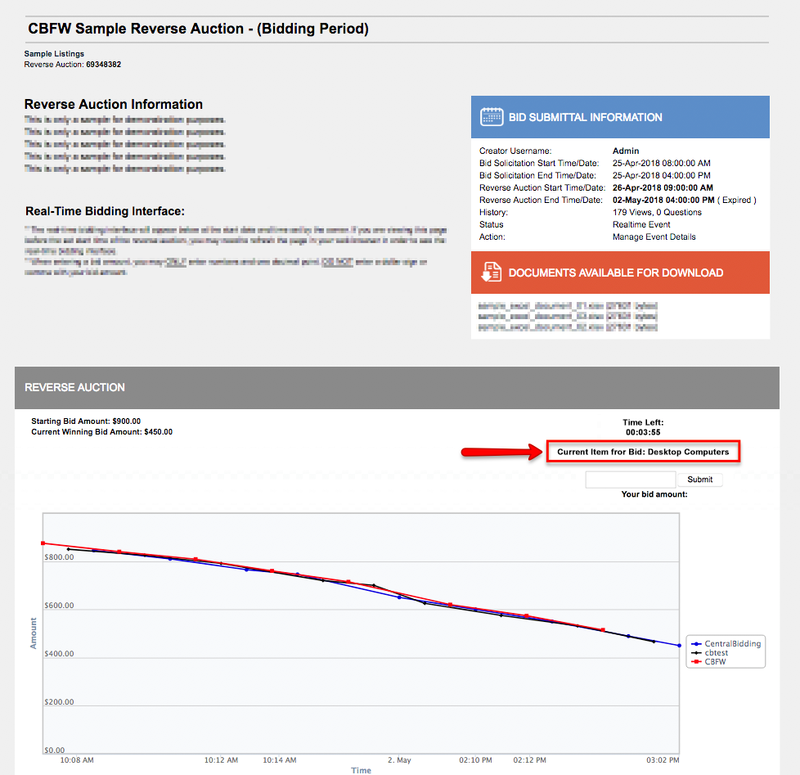 When I go to the Reverse Auction on Central Bidding, I do not see the Real-time Reverse Auction, nor do I see a place to submit my pricing/bids. The Reverse Auction has ended, what is the next step? How do I create a Central Bidding account? Be sure that you have all of the required information concerning the Reverse Auction, and the next step will be to submit your Bid Solicitation before the Bid Solicitation Time Period ends. On the next screen, you will enter all required information outlined by the owner/agency. If you are unsure of the information that is required with your submittal, you must contact the owner/agency to obtain that information. NOTE: Central Bidding has no way of knowing what each agency requires from potential bidders. Upload any required attachments that you would like to submit with your solicitation. Once you’re ready to submit your solicitation, select the “NEXT” button, where you will be taken to a preview of the information you are submitting. When you’re satisfied with your submittal information, you will need to enter your private key/password, then select the Submit button. NOTE: If you have not received a “Solicitation Approved” email from Central Bidding and the Reverse Auction begins in 24 hours or less, you must contact the owner/agency to obtain any information on the approval, or to find out if you are approved or not. Central Bidding will not be able to give you this information. Once the Reverse Auction begins, login and go to the Reverse Auction listing. In the Real-time Reverse Auction interface, you will find info such as the set starting bid amount (if set by owner), the current winning bid amount, the amount of time left for the Reverse Auction, bid amount chart data, as well as the bid history below the Reverse Auction interface containing all previously submitted bids. Enter your bid amount into the bid amount field and click the Submit button. Once you enter your bid, you will automatically see it appear on the chart, as well as the bid history area below the chart. During the live bidding, you will be able to see your own username, but any/all other bidder usernames will be displayed in alternating colors as “Bidder1”, “Bidder2”, “Bidder3”, etc. until the auction period ends. 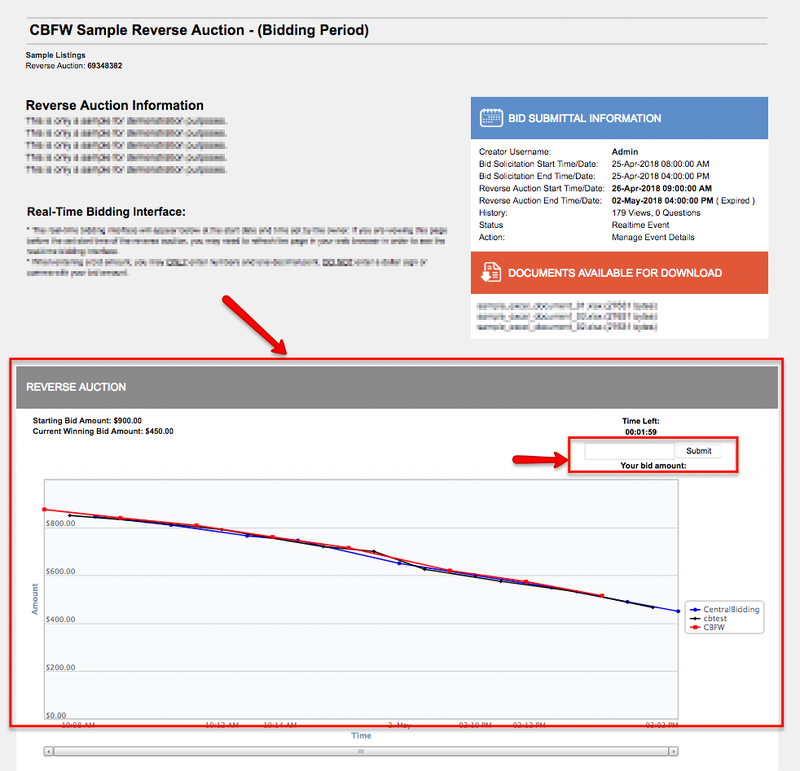 Note: If the owner has enabled the Anti-Bid Sniping feature, the auction will automatically be extended an additional 5 minutes, each time a bid is submitted within the last 5 minutes of auction. Once the auction expires, all bidder usernames will be displayed publically. If you do not see the usernames once the time expires, you may need to refresh/reload your page. If you are listed as the low bidder, you will need to contact the agency/owner directly for more information. NOTE: Do not contact Central Bidding for any information pertaining to the awarding of the bids, as we have no way of knowing the process the owner/agency utilizes in awarding the bids, who will be awarded, nor when they will issue the award(s). Once the time expires for the current item, the next item for bid will appear after a brief pause, and the bid submittals can then resume for the next item, and so on, until the final item has expired. NOTE: Once the final item has expired, there will be no bid history displayed on the page. You will need to contact the agency if you wish to view the bid history and/ bid results. Central Bidding will not supply bidders with this information once the auction expires. There is no Anti-Bid Sniping enabled for Multi-Line Item Reverse Auctions, which means if a bid is submitted within the last few seconds, the auction time will not be extended. Anti-Bid Sniping is a feature implemented on Single Item Reverse Auctions that prevents a bidder from attempting to submit a bid at the last second, in order to "beat the clock" and other bidders by not giving the other bidders another chance to submit their additional bid(s). If the owner/agency of the Reverse Auction has enabled the Anti-Bid Sniping feature, the auction will automatically be extended an additional 5 minutes, each time a bid is submitted within the last 5 minutes of auction. This process will continue to extend the auction as many times as necessary, until no bids are submitted within the remaining 5 minutes of the auction. All bids currently hosted on Central Bidding will be listed in Central Standard Time. See the section on “Solicitation Submittal Process” for more info. There are no set increments. Bidders can enter any price they choose. Can I place an "absentee" bid? 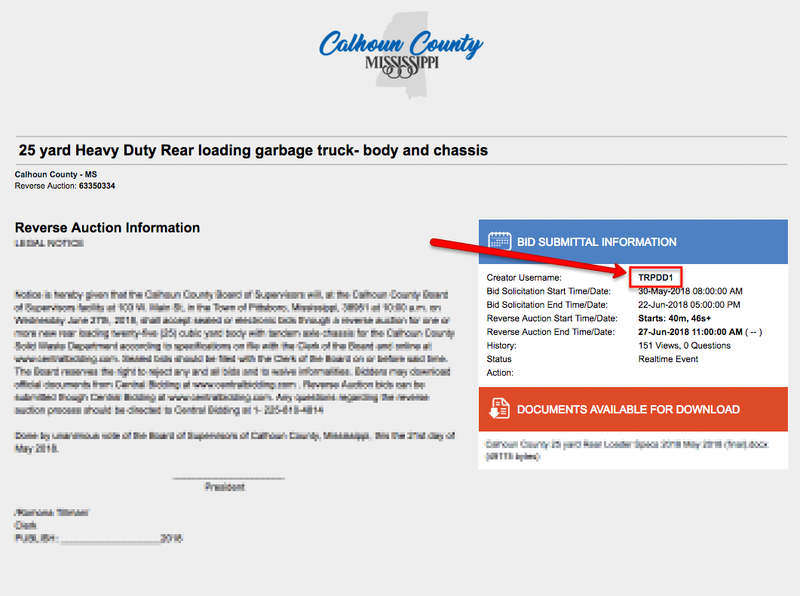 If you prefer to submit your bid for a Reverse Auction on paper or in person, you must contact the agency/owner of the listing for more information or to confirm that they will accept your bid using this method. You must contact the agency/owner of the listing for more information or to confirm that they will accept your bid using this method. Reverse Auctions on Central Bidding are set to run in “Blind” mode, which means that during the Live Reverse Auction, you can see your own username and prices, you can see all other prices as they’re submitted, but you cannot see the usernames of the bidders submitting the prices until the time expires and the Reverse Auction has ended. Once the Reverse Auction ends, you will need to contact the agency/owner directly for more information concerning bid results, awarding of bids, etc. NOTE: Do not contact Central Bidding for any information pertaining to the awarding of the bids, as we have no way of knowing the process the owner/agency utilizes in awarding the bids, who will be awarded, nor when the agency/owner will issue the award(s). You will need to contact the agency/owner directly for more information concerning solicitation approval, bid results, awarding of bids, etc. Per-Project Fee ($49.99): Gain access to ALL available attachments on any one project. To utilize this option, you must be logged in when you select an attachment to download. Central Bidding charges no fees to the bidders, nor to the winning bidder, for taking part in the Reverse Auction process. There is no cost to submit Reverse Auction Bids through Central Bidding. The Live Real-time Reverse Auction Interface will not appear on the listing until the Reverse Auction period has begun. If you visit the Reverse Auction and the time has not reached the start time, you can refresh/reload the page in your web browser, or go back and come to the page again once the time has reached the Reverse Auction start time set by the owner/agency.